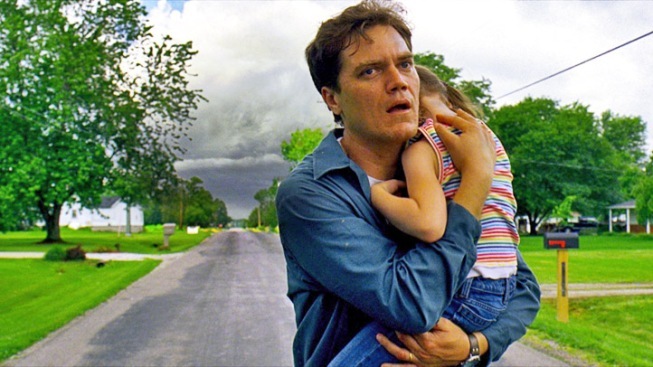 Whether it's a parable about madness, isolationism, fear-mongering or meteorology, "Take Shelter" is a powerful drama about a man holding on by a thread, driven by another great turn by Michael Shannon. Written and directed by Jeff Nichols, "Take Shelter" stars Shannon as Curtis LaForche, a Midwestern family man who works for a mining operation. His wife, Samantha (Jessica Chastain), is a stay-at-home mom who takes in sewing to augment the family finances, which are tight, in part because they want to pay for their deaf, 6-year-old daughter, Hannah, to get a cochlear implant that will allow her to hear. One day Curtis awakens from a terrible dream, a vision of a powerful storm on the horizon, with slick, brownish raindrops like spent motor oil. As the week progresses, the dreams become more and more horrifying, eventually bleeding into his waking life. Convinced that a great storm really is coming, Curtis begins to build out the underground shelter in his back yard, at great expense. Soon he's managed to anger or upset nearly everyone around him with his increasingly bizarre behavior. Shannon is his typically brilliant self as Curtis, slowly loosing his grip on reality as his visions become more terrify and more frequent. The only criticism one might muster is that Shannon has done troubled/mad/repressed so often now that you go in assuming he's haunted in one way or another, which takes some of the magic out of his performance. Still, watching him slip away is amazing. Chastain's 2011 Traveling Chameleon Show marches forth here as she morphs into a stretched-to-thin homemaker trying to hold her family together. How she manages to look like an ethereal vision of beauty one minute and a haggard housewife the next is a mystery. But it's write-director Jeff Nichols who's the star of "Take Shelter," as his beautifully ominous direction brings his script to life. The rainstorm might be the most exhausting cliché in film history, and yet, Nichols makes it work. The storms aren't a lazy shorthand arriving to set the mood, rather, their raging constantly inside Curtis, evoking a fear so great that it becomes contagious.